Download the PDF version (411 KB) of this content. In Western Canada1, Public administration accounted for 4.5% of total employment and 5.1% of GDP in 2017. By province, the industry is least significant in Alberta where it represents 4.5% of employment and 4.1% of provincial GDP. 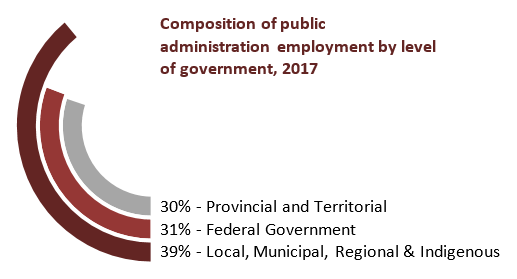 Public administration is much more significant in the three federal territories though, where the industry makes up more than 20% of employment and around 18% of GDP. Continued growth and investment in public administration depends largely on government revenues. Employment in the industry only recently began trending upwards again after contracting for several years as the federal government looked to find efficiencies and balance budgets following the 2009 recession. Looking ahead, it is expected that prairie province governments will restrain their spending in light of lower commodity prices and resulting reduced tax review. Beyond civil servants and government officials, the industry also includes members of the Canadian armed forces, policemen, and firefighters. Major occupations include: police officers and firefighters (NOC 626); administrative and regulatory occupations (NOC 122); policy and program officers, researchers and consultants (NOC 416); and administrative support clerks (NOC 144). The federal government's political authority extends over all of Canada. The central government imposes taxes on Canadian citizens and businesses, and on non-resident businesses engaged in activities within Canada. The federal government provides collective services such as national defence. It also provides services that benefit individual households and helps fund health and education through major transfers to the other levels of government. Though its share of employment has declined over the last decade, the federal government accounted for 1.4% of all employment in Western Canada in 2017. A provincial and territorial government uses its fiscal authority to tax citizens and businesses that live in or engage in economic activities within its jurisdiction. 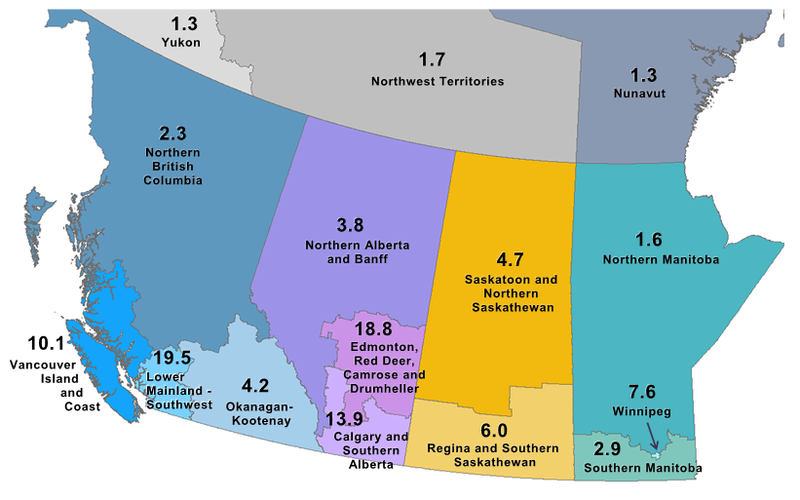 Provincial and territorial public administration accounted for 1.3% of all employment in Western Canada in 2017. As with the federal public service, the provincial sub-industry's share of total employment has fallen over the last decade. Women are well represented in Western Canada's public administration industry, making up 51% of total employment8. By comparison, women accounted for an average 46.7% of employment in all other industries in 2017. Representation of women in Western Canada's public administration industry has grown at a more rapid pace than other industries over the last few decades. Average annual employment growth in the public administration industry is expected to be positive in most sub-provincial economic regions in Western Canada.21 Among provinces and territories, only British Columbia and the Northwest Territories are expected to see an overall decrease during the 2018-2020 projection period. Alberta leads growth projections with an estimated 1,500 jobs to be added by 2020. Note: The territorial forecast represents employment for public administration and defense. In 2017, only two of British Columbia's seven regions saw employment growth in public administration. Lower Mainland-Southwest saw the largest decrease in employment (-2,700) among British Columbia regions, while Thompson-Okanagan experienced the highest growth (+2,500). The largest shares of public administration employment in Alberta are found in Edmonton (45,400) and Calgary (32,100). Employment in Edmonton dropped 7,200 over the last year, while growing rapidly in Calgary (+8,100). Calgary's large employment gains allowed Alberta to lead total public administration job growth among Western provinces in 2017. Province of Manitoba. Transforming the Manitoba Public Service. 2018.